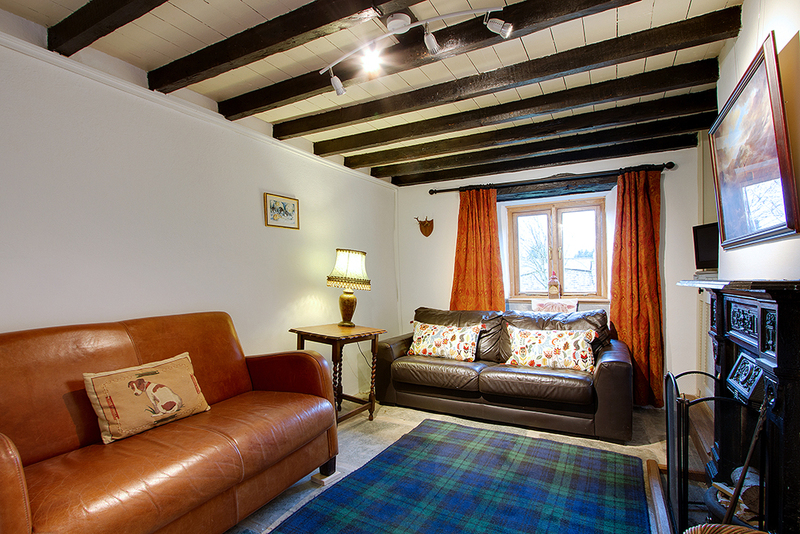 The Low Farm is a beautiful, 17th century, stone Long House in a stunning location in the breath taking Duddon valley. 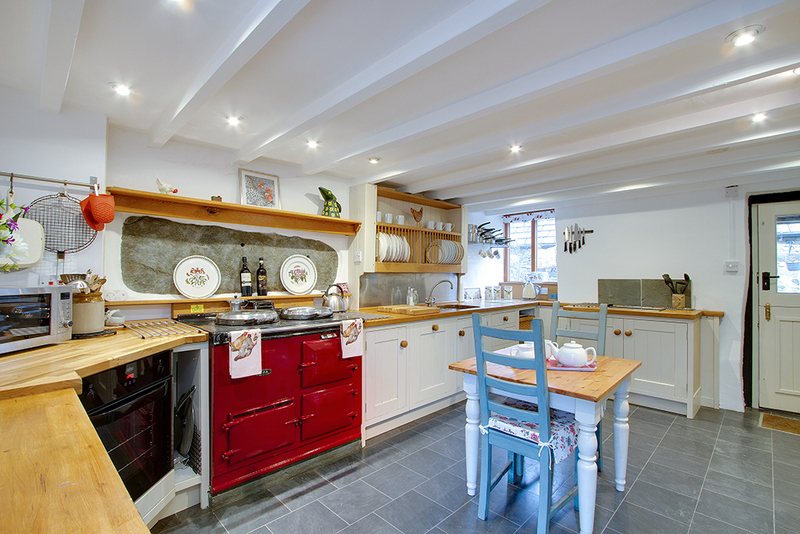 This traditional Lakeland cottage has generous accommodation for up to eight guests, in 4 bedrooms, and has many original features, including flagstone and Oak floors, beamed ceilings, wood burning stove, open fire places, Aga, original doors, timber paneling and a lovely wood fired hot tub. 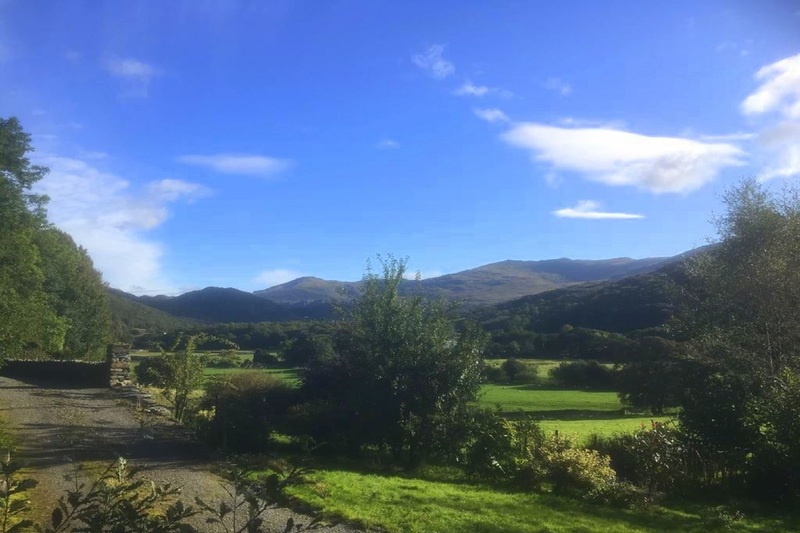 It sits on a generous plot with beautiful gardens, great views and ample parking, just a short walk from the babbling, clear waters of the River Duddon. 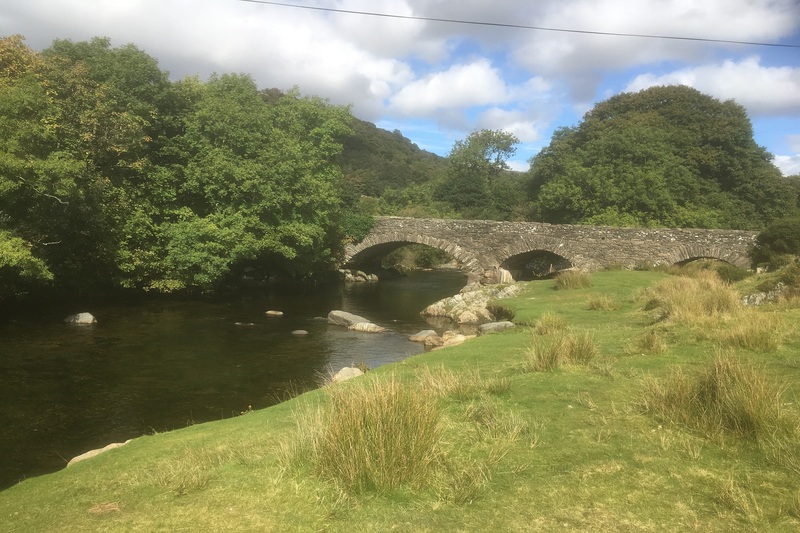 The spectacular scenery of the unspoiled Duddon valley made it a favourite location of both William Wordsworth and Alfred Wainwright, both of whom wrote extensively about this beautiful part of the Lake District. 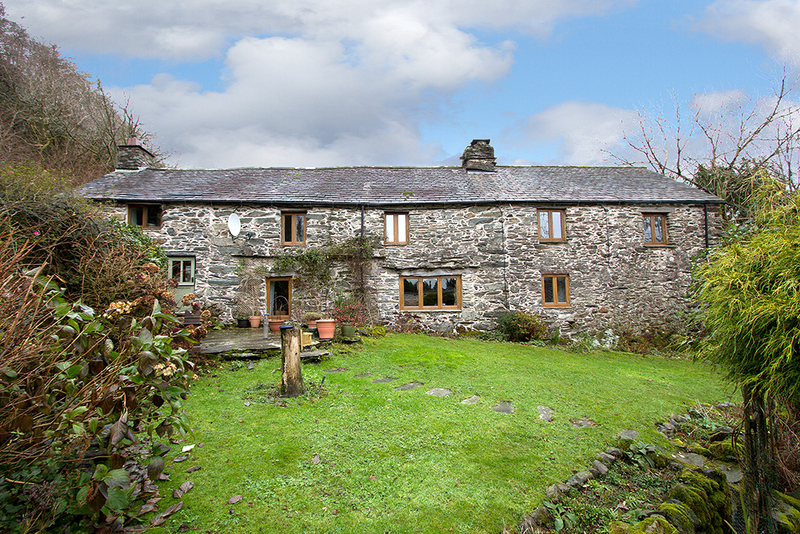 Whilst in an ideal location to access the central & southern lakes and all the amenities on offer, the pretty village of Ulpha is an oasis of peace and quiet in an area still dominated by traditional fell farming. It is situated 4 miles north of Broughton-in-Furness & is a popular destination for walkers, cyclists, anglers, nature lovers and those just looking to rest, relax, breathe fresh air and take in the sights. Kitchen: Stable door in stone entrance porch opens into a beautiful, spacious farmhouse kitchen with oak worktops, beamed ceiling, stable door to back garden, Aga, small table with 3 chairs, electric oven, hob, fridge, freezer, dishwasher, microwave, toaster, kettle and all the utensils, crockery and cutlery you would need. Dining Room: Beamed and part paneled dining room with seating for 8 guests around a rustic farmhouse table. Living Room: Spacious living room with local slate floor, wood burning stove, ample seating, Freesat TV, DVD and views over the garden and fells beyond. 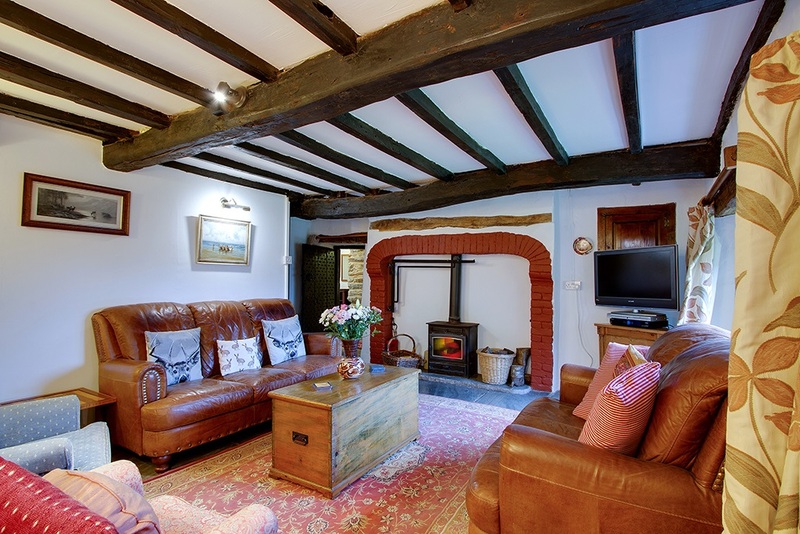 Snug: A small additional sitting room with sofa, armchairs, flagstone floors, open fire place and TV. There is a cloakroom and W.C. adjacent to the snug. Utility Room: Located in the barn, just outside kitchen door is a large utility / drying room, with washing machine, dryer, clothes hangers, boot racks and backup fridge / freezer. This can also be used for bike storage, as can the log store. 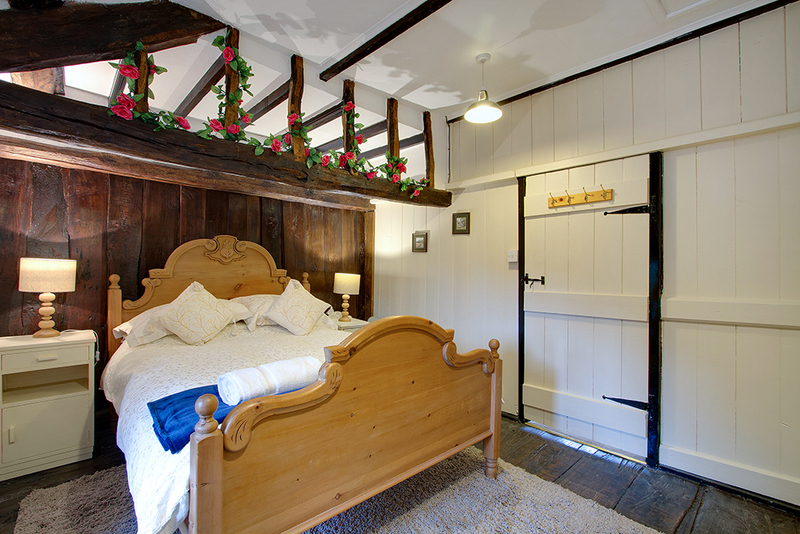 Bed 1: A charming room with king sized bed, feature fire place (not in use), large wardrobe, chest of drawers, bed side cabinet and outlook over back garden and fells beyond. 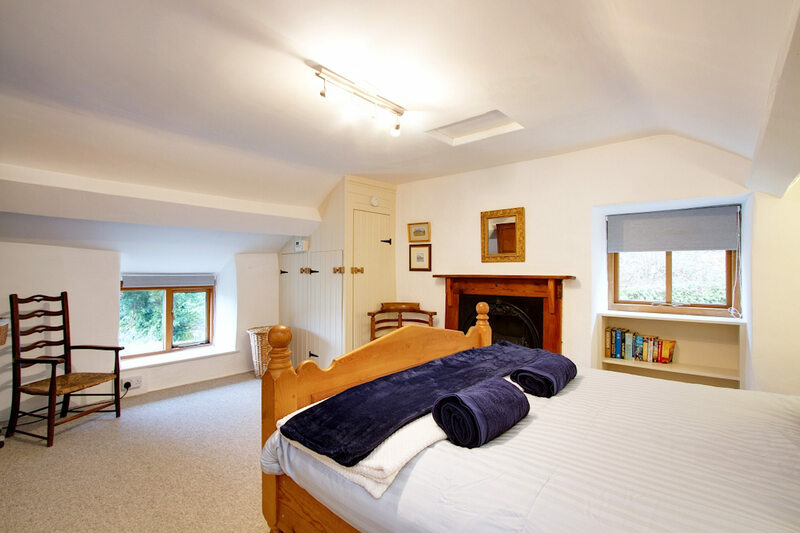 Bed 2: Character filled room with original Oak floor, Oak paneling, wash hand basin, built in wardrobes / clothes storage, bed side cabinets and view over rear garden and fells. Bed 3: A spacious twin room with a third pull out trundle bed, wardrobe / clothes storage, bed side cabinets, it’s own access via an external flight of stairs and lovey views to front and rear. 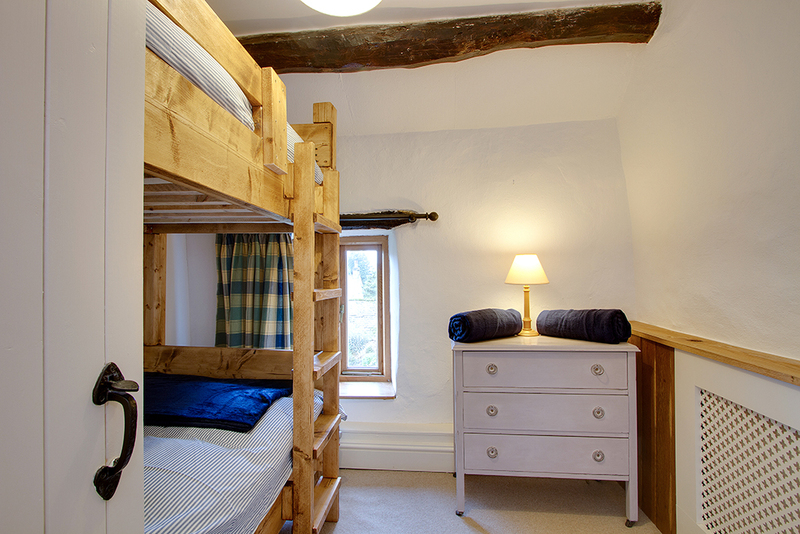 Bed 4: A cosy room with bunk beds, clothes storage and outlook over back garden. Family bathroom: Large bathroom with lovely cast iron roll top bath (2 person size), separate shower, toilet, basin, fan heater and heated towel rail. 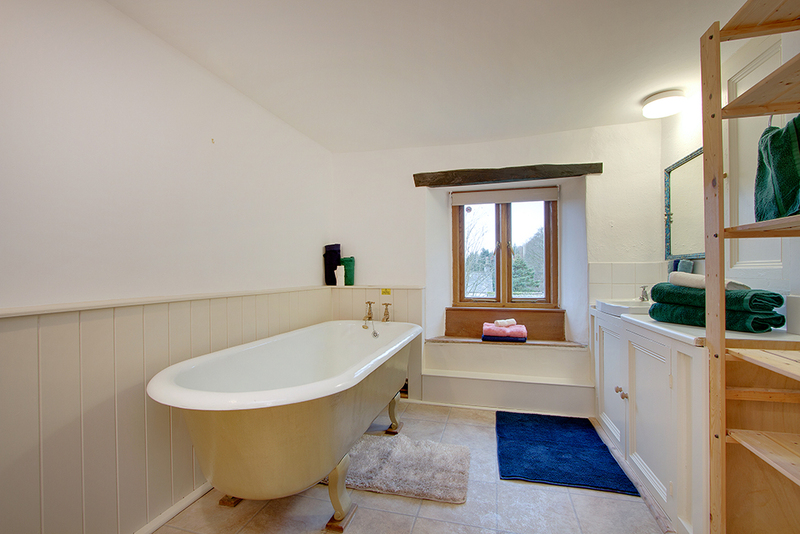 Shower Room: adjacent to bedrooms 1 & 4, with shower, basin, toilet and heated towel rail. 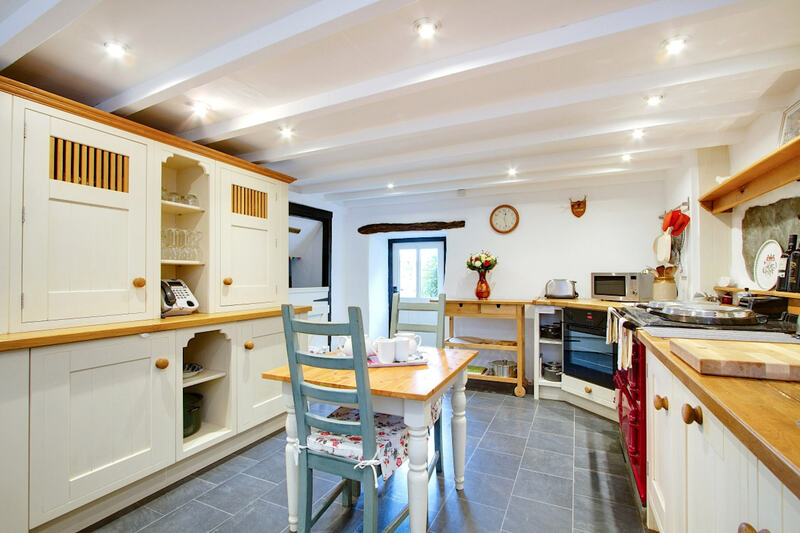 Outside there is ample parking for 3 or 4 cars, beautiful south facing cottage garden to the rear, further garden with pond to the front and stunning, far reaching views over the river and surrounding fells. There is ample outdoor seating, picnic tables and BBQ. A Scandinavian style, wood fired hot tub is available to guests at an extra cost of £60 per stay. The perfect way to relax and enjoy this lovely location and the amazing night skies that this area has to offer. Click here to see operator instructions & Health & Safety Guidance. 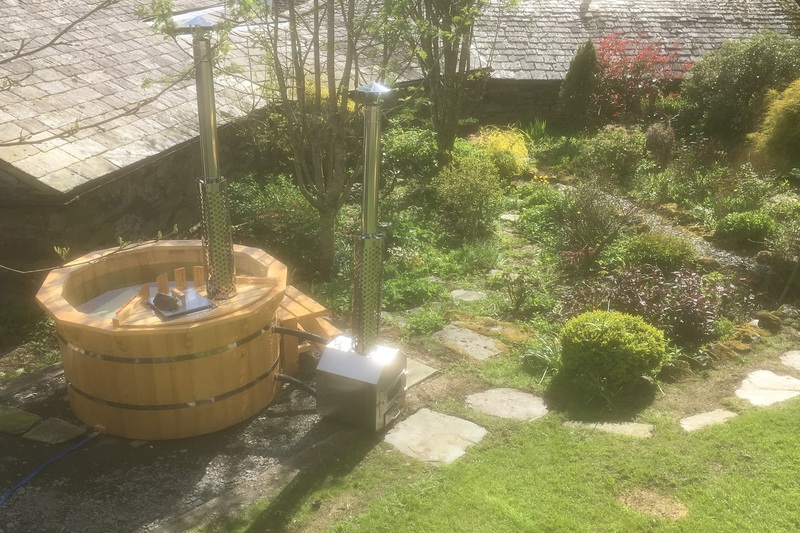 Please be aware that this is a traditional hot tub and not a Jacuzzi / spa and water is heated by two wood fired burners, which may take some while (up to 4 hours in first instance) to heat. The village of Ulpha has a small shop / post office and the Newfield Inn / restaurant is 1.5 miles (comfortable walk) away in neighboring Seathwaite. The Blacksmith’s Arms in Broughton Mills (4 miles) serves great food and local beers and there are numerous other hostelries in nearby Broughton-in-Furness and Eskdale. The Stepping Stones and Ulpha Bridge are popular spots for swimming, picnicking or just messing about by the river. There is great fishing in the area, Wasdale & Eskdale are a short drive away and for those looking for a bigger challenge Scafell Pike (highest mountain in England) and The Old Man of Coniston are within easy reach. And if its a day at the beach you’re looking for there is a lovely coastline and shingle beaches at Haverigg, Silecroft & Silloth, between 10 & 12 miles to the south. There are many tourist attractions in the area, including Muncaster Castle and Ravenglas & Eskdale Railway. Berneray Log CabinAnd further afield….